Cardinal Ratzinger (the current Pope Benedict) left the lines of his compulsory military duty in Germany. He should have been shot on sight for this. However, he escaped unharmed. 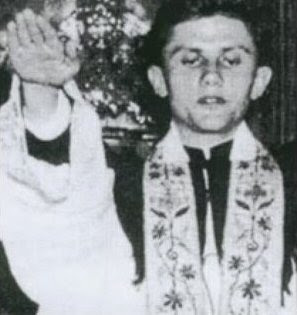 This picture is also not of the young priest making a Nazi salute, but a doctored photo of when the priest extends his hands over the gifts at Mass.